I never “got” those Magic Eye things. Literally, there’s never been a single one where I was able to see the picture. Tell me what the answer is, and maybe I could pick out a little shape in there that was part of it, but in general, I like half-believe it’s all some grand scam, an “emperor’s new clothes” scenario where people say they see it just to avoid looking bad. The point is, people can see the same thing in different ways. Maybe you did see a spaceship, but I saw a bunch of colorful squiggles. That doesn’t make either of us wrong. It’s like a Rorschach test. Which brings me to fantasy football. No matter how smart you are (and some of our PFF folk are crazy smart), you can’t exactly predict how every player will do in fantasy. If you could … well, fantasy would be boring. Different people can look at the same information and draw different conclusions. I see Julio Jones and see a wide receiver who has 1,400-plus yards four years in a row, think he’s just had some bad touchdown luck, and am taking him in the middle of the first round of drafts. You might see him as a guy who struggles to reach the end zone and packs too much of his overall production into just a few weeks and push him down to the middle of the second. Is one of us wrong? Probably. And probably, one of us is right. But just from looking at the numbers, we can’t know. A hundred of us can look at the same bits of data and information and come to a hundred different conclusions. That’s why we like this game we play. And in that spirit, what is below — my favorite statistics and takeaways from the Fantasy Playbook, our 2018 draft guide (available now!) — is not meant to be a decisive look at the 2018 season. It’s just what I saw when I looked through it. You’ll probably see something else. And you should. No one saw Alvin Kamara coming last year — at least not to that extent. He was the No. 3 PPR running back on the year after being the No. 3 running back drafted on his own team entering the year. And clearly, Brees threw the ball to him (and Mark Ingram) a whole bunch. Which raises the question — what would Brees’ 2017 have looked like without Kamara? There’s one argument that age has started to catch up with Brees, and you can look at that “20 percent” number as evidence that a big percentage of his production came because Kamara was so electric that he could take a short pass (Brees had the fourth-shortest average depth of target a year ago) and make something out of it. Me, I believe Brees basically ran with the hot hand in Kamara, and Brees is more or less as good as he’s always been (he had the second-best PFF grade among quarterbacks in 2017 at 88.6). With Kamara and Michael Thomas — among others — available as weapons, I predict a big fantasy rebound from Brees in 2018. 2. 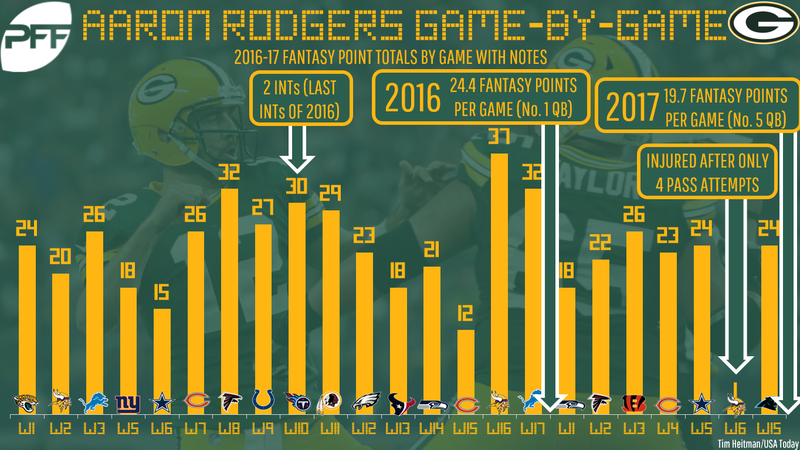 In games he’s stayed healthy, Aaron Rodgers hasn’t finished outside the top-20 fantasy QBs since 2016. Rodgers was the No. 31 QB in Week 6 of last year, when he got hurt in the first quarter, but other than that, his worst finish in the last two calendar years was as the No. 19 QB, which he was two different times in 2016. A quarterback’s ceiling is of the utmost importance — and Rodgers has ceiling in spades, of course — but floor is vital as well. A quarterback who finished first one week and 30th the next is outrageously frustrating to own. That’s not the case with Rodgers, and it’s a big part of why he’s the near-universal No. 1 quarterback for 2018. 3. 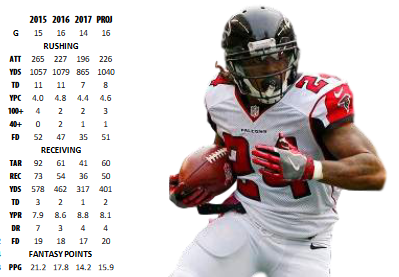 Devonta Freeman’s per-game fantasy scoring has dropped by 7.0 points in two years. Freeman was the No. 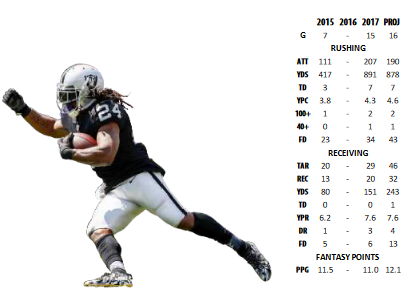 1 fantasy running back in 2015, a full 58 PPR points ahead of second place. His finishes the last two years were also wholly respectable, coming in sixth in 2016 and 14th in 2017. But that disguises how his overall production has dropped off — he went from 21.2 points per game in 2015 to 17.8 in 2016 to 14.2 in 2017. This illustrates how Freeman has fallen off a bit, but more than that it illustrated the gap between the uber-elite fantasy backs and the merely productive ones. On the surface, a running back finishing 14th — or even sixth — sounds great. But in reality, the gap between the No. 1 running back (and Freeman had the worst finish for the No. 1 back since 2008) and the next tier of guys is more significant than it looks at first blush. That’s why the keeper value for a guy projected to finish as a top-two or top-three back is so significantly more than for a guy who is a borderline top-10 finisher. 4. On a per-game basis, Marshawn Lynch was worse in his first year with the Raiders than in his last year with the Seahawks. Lynch’s final Seattle season was an injury-plagued quasi-disaster. He only put up 3.8 yards per carry, missed nine games, and didn’t break a single run of longer than 24 yards. By the time he was done for the season, he was losing time to Thomas Rawls. Despite that, he put up 11.5 fantasy points per game for the season, which was … 0.5 more than he averaged last year as the Raiders’ undisputed No. 1. Lynch is currently the No. 28 RB in ADP, and while his backup (Doug Martin) has plenty to worry about himself, I can easily see more downside to Lynch in 2018 than upside. 5. Based on current projections, Bears quarterback Mitchell Trubisky has the third-best strength of schedule in 2018. Don’t enter 2018 with Trubisky as your starter in one-QB leagues. Frankly, going in with him as a starter in two-QB leagues is dicey. But Trubisky is now a year into his career, and after spending his rookie season with his best weapons being Kendall Wright, rookie Tarik Cohen, brittle Zach Miller, and stone-handed Jordan Howard, he now has Allen Robinson, Taylor Gabriel, Trey Burton, Cohen-with-a-year-of-seasoning, and promising rookie Anthony Miller. And his schedule is promising — particularly the middle, as from Week 3 to Week 10, he doesn’t face an opponent lower than 13th-easiest (around his Week 5 bye). Trubisky (and the Bears at large) is among my sleeper plays for 2018, and the schedule he faces is one of the reasons. 6. He’s only in his second year, but 2018 has all the makings of a make-or-break season for Joe Mixon already. The Bengals made strides to improve their offensive line this offseason, trading for Cordy Glenn and drafting Billy Price. Jeremy Hill is gone. And they don’t face a defense ranked in the bottom 10 for opposing running backs until Week 13, and only face two all season. Giovani Bernard isn’t going anywhere, but Mixon is expected to be the guy for the Bengals (and fantasy owners), and we’ll know soon enough whether that trust is properly placed. There are my six top takeaways for 2018 for quarterbacks and running backs, based entirely on our draft guide (one more time: here’s the link). But again, those are just my takeaways. You’ll have different ones. You know, if you read the guide. Which you should.